Troubadours - Trilogy Players Invite You To Come Have Fun! The Toubadours meet every Wednesday at 7 p.m at a members' home to practice for upcoming events in which they plan to sing. The group performs regularly for veterans, senior citizens, and others at a multitude of venues. The above photo was taken during a March 2017 Peoria Spring Training game when they sang the National Anthem. Visit The Troubadours website for more information. During a Trilogy Players social committee meeting, Trilogy Players members were brainstorming on putting together a choral group to perform within Trilogy and in the community. In 2013, The Troubadours were born and have become an integral part of The Trilogy Players, performing during shows and representing us well within the Trilogy gates and out in the community. Kathy Ginis, Jan Crawford and Linda Wells, pictured above, serve as the musical leads and JoAnne Conner is the Public Relations Administrator. She scouts places for the group to perform and helps recruit new members while working with the musical leads to organize the group. The group has done numerous holiday programs in 3 and 4-part harmony at veterans homes, assisted living homes and Faith House, a women's safe shelter. 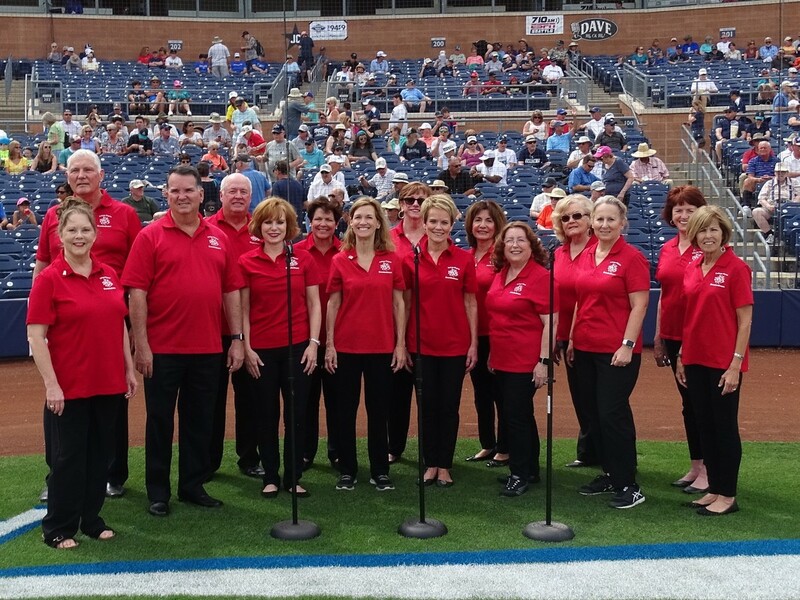 They have performed the National Anthem at Peoria Sports Complex Spring Training games where they also lead the crowd in a rousing round of "Take me out to the ball game!" The focus of the group is to encourage choral stage art through rehearsal and performance in a fun environment. There is no audition requirement to join the group. Any dues-paying member of Trilogy Players is welcome to join during designated enrollment periods. However, at the discretion of any of the directors, a member may be asked to work one-on-one with one of the directors or a vocal coach of their choosing. Regular attendance will be encouraged. For specific performances, each member will be required to have participated in 3 of the preceding 4 rehearsals. As per the guidelines of the Trilogy Players, courtesy towards leaders and fellow members will be expected. Above all, be kind and encourage one another.